Bruce Laidlaw was out and about along M-88 and stopped to admire the elk at Conant’s Maplehurst Farms (a/k/a Conant’s Elk Ranch). He remarked that they were sporting impressive racks. And so they are. I went looking for links about elk (Cervus elaphus) for you and decided there is a lot of balderdash floating around out there. I turned instead to my beloved Stan Tekiela, whose Mammals of Michigan Field Guide is kept handy for emergencies. He writes The British name for the moose is “Elk.” This name was apparently misapplied by our early settlers and has remained since. So if the early settlers had had the benefit of a decent wildlife guide, present-day Michiganians would be calling moose elk and calling elk omashkooz (the Ojibwe name for the critter) or wapiti (the Shawnee word for “white rump”). OK, all you cousins over there in the UK? We’re talking about North American elk today, which are not moose. Nothing like a common language to foster international misunderstanding. There are wild elk herds in Michigan over in the Pigeon River country. Stan says they all descend from seven individuals introduced near Wolverine in 1918. That must have been one heckuva party. The Conants remind the public that the Rocky Mountain Elk at their ranch are wild animals too—not cuddly pets or placid dairy cows (and I could tell you some stories about dairy cows and spaniels, too, come to that). Please do not mess with the elk. They are big and moody and they can run faster than you can. But aren’t they gorgeous? They are. Thank you Bruce. P.S. I finally found a site worth a link: Rocky Mountain Elk Foundation. We sometimes drive over there just for the elk. They are majestic. As Oscar Wilde once observed, England and America are two countries separated by the same language. . . . He was a wise man. Or a wiseacre, take your pick. Either way he was right. Very impressive! I had no idea they shed their antlers and grow new ones each year?! Seems like one of Mama Nature’s little jokes, doesn’t it? Imagine how good it must feel when the buck sheds the 30-40 pounds of bone he’s been lugging around on his head. Biology is filled with mysteries. I’m completely confused now. I would have called that majestic creature up top an elk, for sure. But somehow I have a picture of a “moose” in my head that has a different sort of antler – more paddle-like, not so branchy. I’m going to have to go off and do a little antler-comparison. Maybe I’m thinking of a European variety – possible, since I have a couple of photographer friends in England who go off to game parks and take pictures. In any event – WOW! 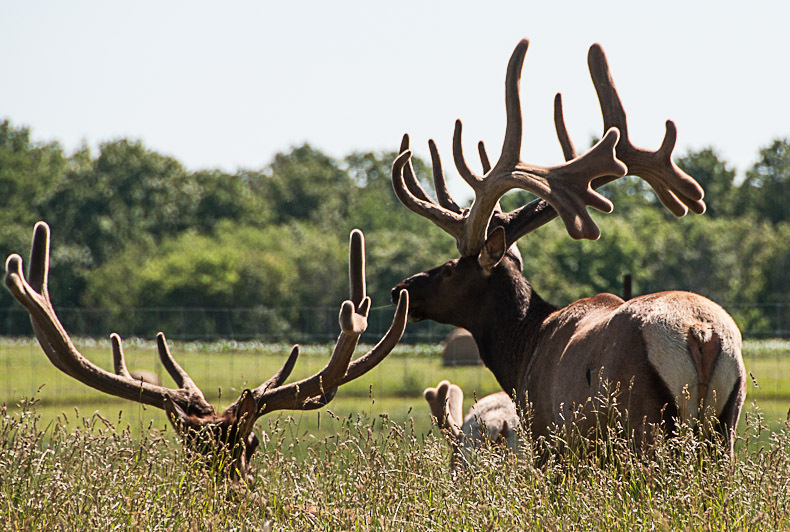 Have you ever had the chance to touch antlers that still are velvety? I haven’t, but I sure would love to. The majestic creatures in the photo are Cervus elaphus–elk to anyone in North America. The large critters with paddle-shaped antlers, Alces alces, are moose to anyone from Around Here, but elk to people in Great Britain. I have been up close to moose on Isle Royale, but have not ventured to touch any part of them. My experience with elk in Michigan is limited to sightings from a distance or from the other side of the Conants’ sturdy fence. They were considerably closer in Banff, Alberta, back in 1995 or 1996 when a Canadian rail tour stopped there. We arrived in early September, during the rut, and the elk bugled all night. They are big. I would sooner pet a bear. A few years later the town of Banff had enough, and most of the elk were relocated. Dunno how things are going now. By the time antlers are shed, the velvet has all worn off and the antlers are bone. I have held shed antlers, and they’re pretty cool themselves, but not at all pettable. A majestic creature indeed. The antlers don’t look as symmetrical as I would have imagined them to be. I’m sure an elk has a much more difficult time walking through the forest with that huge rack on its head and bumps into all kinds of things, especially other elks (on purpose) during mating season. They seem to have a sort of abstract symmetry – balance without duplication. I don’t know about the wild herd, but the Conant elk loll about in a great deal of wide open pasture. Lovely creatures. No elk here, but I thought at one time someone had corralled a bison. Not that it was wild and loose, mind you. We don’t get a lot of animal traffic due to 3 sides of water, sometimes 4. Still, ice manages to create a bridge sometimes. Cougar sightings have been documented. Wolves? Not often. Tourists? Plenty. Thank you. I enjoy the elk. There are a couple of bison ranches Around Here, too. One of them – the Olesons’ – donates all the meat for the Buffalo Burgers that are a staple of the NMC BBQ every May. Thousands of people turn out to munch on burgers and raise funds for Northwestern Michigan College. There are folks around here – the Olesons, the Dendrinos/Dennos family, the Millikens – whose contributions to the greater good transcend all the foolishness that swirls around public discourse these days. Good to think of them from time to time. Lovely photograph; the Elk look so majestic, well cared for and happy. I wonder if it hurts to lose those huge racks?